Since the time of Silk Road, dating back to 2011, marijuana and related products had been available for purchase using BTC (and now several other coins), but the process is still 100% illegal regardless of where you live. In recent years, however, several governments around the world have been evolving their stance on cannabis legalization, as well as bitcoin itself. This has resulted in some legal applications of bitcoin for the purchase of marijuana which manage to save buyers a lot of hassle they might have previously been forced to endure. 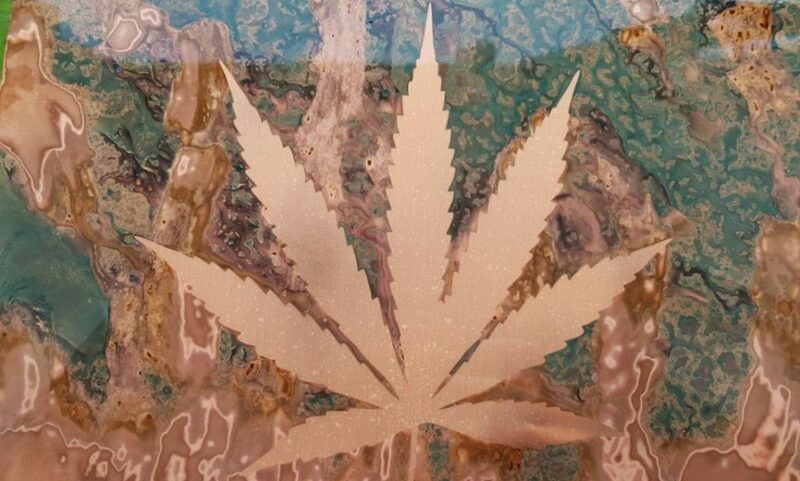 While few nations on the planet outright permit the usage of recreational marijuana, there is a growing list of countries who are reconsidering their laws and allowing cannabis for medicinal purposes. In the United States, marijuana laws are among the more uneven laws on a state-by-state basis, with some states allowing it for both recreational and medicinal purposes and others allowing it for neither. In countries like Portugal, South Africa, and most recently Canada, it is completely legal. In countries like Brazil, Mexico, and Spain, it is illegal but decriminalized, meaning at most a fine will be issued for possession, but generally laws pertaining to the matter are unenforced. 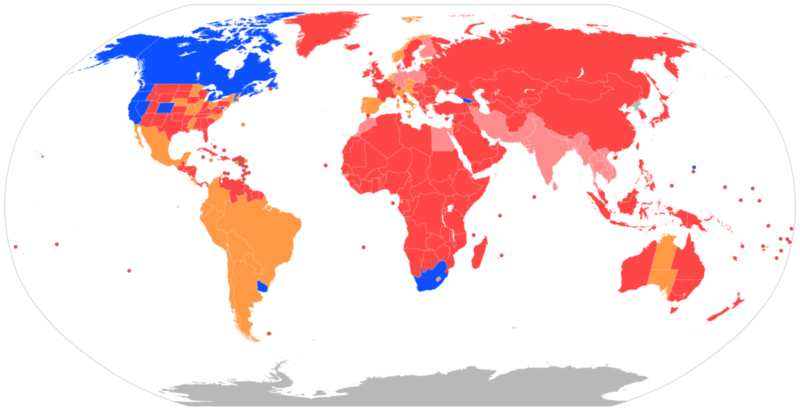 However, in many other countries, like most of Africa, Asia and the Middle East, it is strictly illegal, where punishment for even possessing small amounts can result in lengthy prison sentences. In this way, the laws concerning the consumption of cannabis worldwide are just as varied as cryptocurrency legislation, in that they are pretty far from uniform and frequently subject to revision. In locations where there is an established overlap in friendly attitudes for both cryptocurrency and cannabis, it is now possible to legally buy marijuana, its seeds and its derivative products (oils, edibles, paraphernalia, etc.) using bitcoin as well as other popular coins – a process which for the first 8 or 9 years of bitcoin’s existence had been almost totally illegal. In this article, we take a look at how two of these countries are using cryptocurrency to help ease the process of buying and selling cannabis. Recreational cannabis is currently legal in 10 states, 1 U.S. territory, and the District of Columbia, but remains illegal at federal level, where it is classified as a Schedule I narcotic, along with heroin, LSD and ecstasy. It is decriminalized in another 13 states and legal for medicinal purposes in 33 states, with several more on the verge of passing decriminalization and medical use laws in the near future. However, all cannabis and related product vendors face the same road block due to federal-level laws: banks are not permitted to conduct business with them as they are regulated by the FDIC (Federal Deposit Insurance Corporation). Since cannabis remains illegal under U.S. federal law — and the federal government regulates all US banks and credit unions — banks in general will refuse to issue accounts to these businesses. This usually means brick-and-mortar marijuana dispensaries and other cannabis retailers must be cash-only operations, sometimes sitting on hundreds of thousands of dollars’ worth of cash at any given time. As such, they are a high-profile target for theft and robbery, which is a situation that cryptocurrency adoption is set to alleviate. The cannabis industry in the U.S. is projected to grow by $44 billion in the next 7 years, which has many retailers looking for ways to use cryptocurrency to avoid having to deal with banks. Technology companies specializing in cryptocurrency transactions for retailers, such as SinglePoint and POSaBIT are creating specialized payment methods for dispensaries and consumers who want to use bitcoin. Several dispensaries are located in cities that have an abundance of ATMs, such as San Francisco, Los Angeles, Denver, and Las Vegas. In Santa Barbara, California, it is not only possible to purchase recreational marijuana online with bitcoin, but then have it delivered straight to your doorstep – an idea that is quickly catching on in other areas that have recently legalized its use. 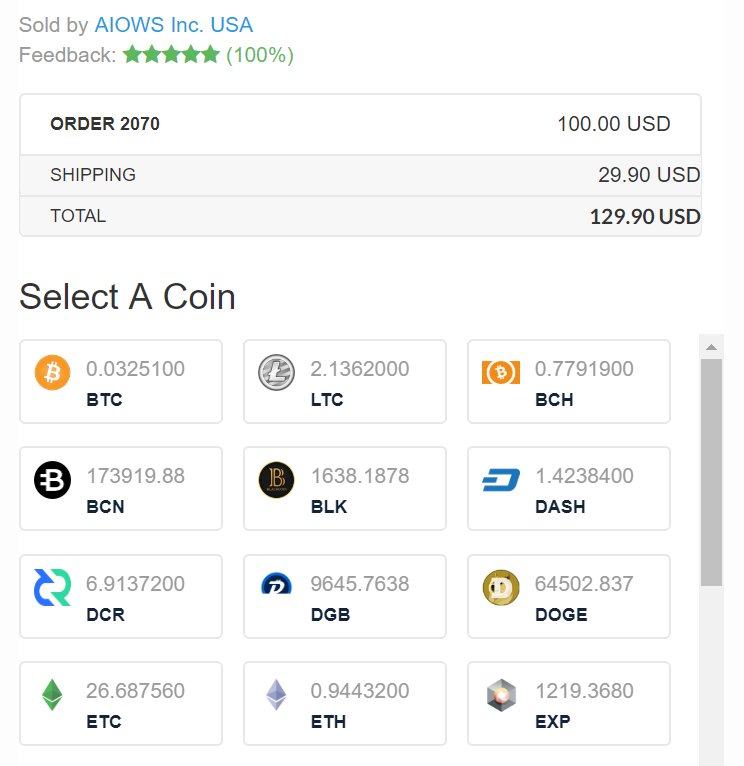 An example of an online vendor accepting multiple cryptocurrencies. Source: AIOWS, Inc. Besides accepting BTC as a form of payment for purchases, there are other ways in which America’s burgeoning marijuana retail market is using bitcoin to get around federal restrictions. In 2018, First Bitcoin Capital Corp announced their registration with a merchant account processing service that included a credit card processor for the states of California and Oregon. The processor takes customer transactions from cannabis vendors and coverts them into bitcoin, then sending the cryptocurrency back to the business, meaning they can accept debit and credit card transactions without having to go through a traditional banking service. Basically, customers in these states now have the ability to pay for cannabis using credit and debit cards from shops that use their services. A new California bill introduced to the state senate in February would allow cannabis dispensaries to pay their taxes in the form of stablecoins, which would be a significant upgrade from having to pay taxes in cash, as they do currently. Per the bill’s text it would authorize cities and counties to determine individually whether they wanted to accept taxes paid in stablecoins directly into a wallet controlled by their jurisdiction or utilize a third party processor which allowed for the immediate conversion of stablecoins to dollars. The bill also demonstrates just how swiftly governments are changing their attitude about cryptocurrencies, recognizing their potential to save time and money not just for their constituents but for their own internal processes as well. On October 17, 2018, Canada enacted legislation that effectively made recreational marijuana legal for those of age 18 and older. It is legal to possess up to 30 grams at one time in public. Plant growers can obtain licenses by the federal government, and it is up to individual provinces determine how products are distributed and sold within their territory. This all occurs without direct promotion from the government, as advertisement of cannabis is still not endorsed or encouraged at a federal level. Immediately, several merchants began adopting bitcoin as an accepted form of payment, with some shops offering as much as a 20% discount for bitcoin-based purchases. From purchasing growing equipment, to seeds, to the plants and buds themselves, BTC can be used to acquire just about anything cannabis-related in Canada. We talked to one Canada resident who was particularly fond of both cannabis and bitcoin about his experiences in making such transactions, and how he managed to find information to make them possible. We are keeping him anonymous because it is still a sensitive issue, and while it may not be a problem in Canada, it could be a problem if he decides to travel elsewhere. “I think I just googled ‘weed BTC’ and searched a few sites,” he said. “Did a small $50 test order and product arrived 3 days later.” When asked about the particular benefits he saw in using BTC over cash, he said that “the biggest advantage is, my wife doesn’t bust my balls about how much ‘money’ we spend on weed. 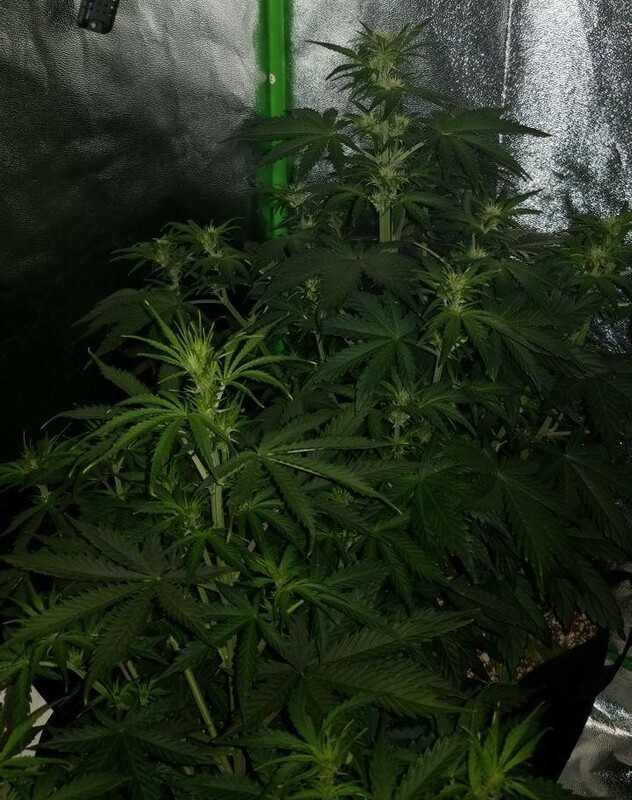 I make a few satoshi online (which still isn’t really money to her) and I use that to get ‘free weed’, according to her.” He further explained to us that he used an online vendor to purchase some high quality seeds for BTC so he could begin his own plant growing operation. “All together I paid less than $500 CAD, so it won’t take more than 1 or 2 grows to pay for itself,” he said. 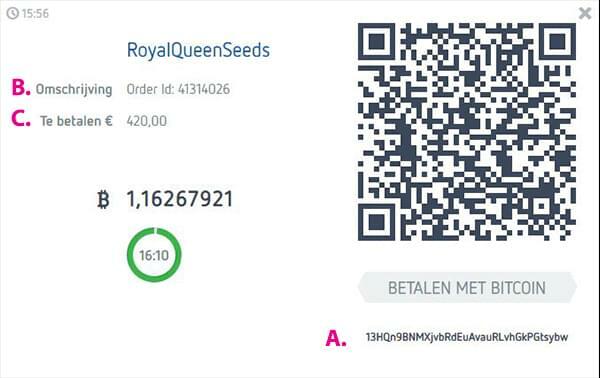 Plants being raised from seeds bought with bitcoin. Another unique advantage of using BTC when purchasing cannabis for Canadians is that their purchases are not tracked by traditional debit and credit card reporting services, which could be used as a reason to deny their entry into the U.S. at the border. It is not known how such data is obtained by U.S. border patrol agencies, but what is known is that Canadian travelers are frequently questioned about their prior marijuana use and sometimes turned away for simply admitting that they had, whether it was recently or even 20 years ago. Launching in January 2014, PotCoin (POT) is by far the most successful of all the coins targeting the cannabis industry and its customers for adoption. Though it remained relatively obscure for its first few years, it has since found a niche of users, especially since various states in America have begun reforming their marijuana laws and looking for alternate methods of payment. It is now accepted by a number of online and brick-and-mortar retailers in the U.S. and Europe. Just type "potcoin" into google to see how amazing it is. Medical Clinics, Pharmacies, Dispensaries & more are learning how to successfully integrate #potcoin into operations. With 40 second block times and transaction fees averaging around 1 cent, PotCoin is a much faster, cheaper way to make a cryptocurrency payment than BTC. Another one of PotCoin’s advantages over cash is it being safer to carry than cash, stored in a phone wallet that can be backed up and locked. As we discussed earlier, most businesses in the cannabis industry accept cash only, which puts the funds of both customers and vendors at risk of being seized or stolen. As a cryptocurrency, PotCoin is digital and decentralized, so funds can be transferred seamlessly from customer to merchant, keeping both parties safe during the transaction process. As the world continues to evolve its stance toward both cannabis and cryptocurrency, becoming more accepting of both, it is likely that the intermingling of the two will continue in advantageous ways. New ways to save money and time for those involved as either merchants or customers will be explored, while simultaneously increasing their safety and even responsibility as part of the process.